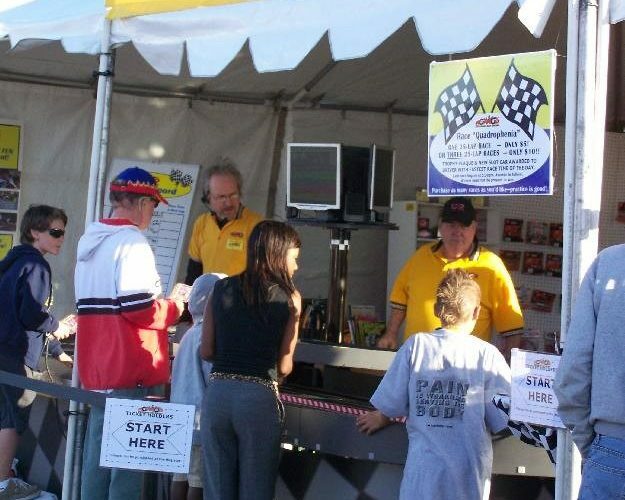 Nomad Raceways brings racing excitement to your next event. 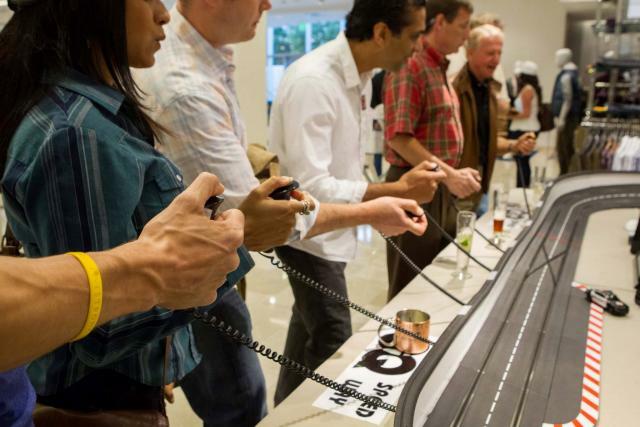 We are entertainers with table top car race games that your guests control with remotes. 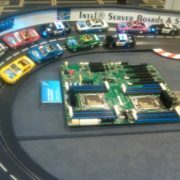 Nomad Raceways has optimized slot car racing using new technologies and long professional experience. 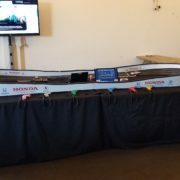 Our races are fun to watch and exciting hands on! We have track sizes for any location, can operate on our batteries or single standard outlet. We know how to entertain at a children’s party or adult VIPs, how to attract and engage at a convention, promote your brand or impress a CEO. We bring the fun anywhere, worldwide, and we handle all the details. 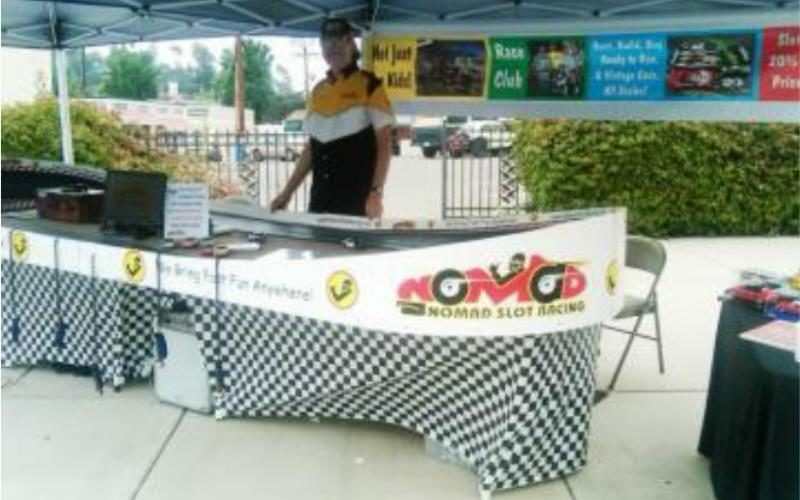 Nomad portable slot car racing tracks are delivered to most events in the US in our trucks. For more distant events, we have crated tracks freight ready or tracks in flight cases that travel with our staff as checked baggage and assemble on-site for maximum cost-effectiveness. We travel internationally and have performed at events in across the USA, Canada, Europe, and Dubai, UAE. Our experienced presenters engage and entertain. 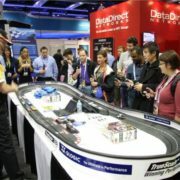 At trade shows our interactive game draw attention and provides a memorable hands-on experience. 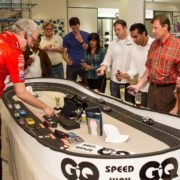 We can conduct an uninterrupted series of 3 minute races for up to 6 participants at a time engaging hundreds of clients each day. 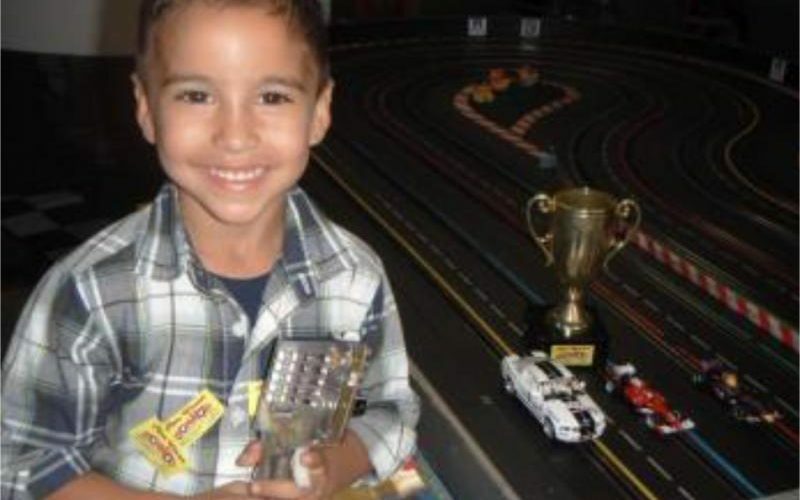 Promotional items become valued race prizes. An exciting championship race can replace a disappointing raffle. 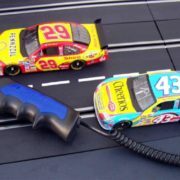 The track and cars can be branded to your specifications., So your logo is where the action is. In hospitality or company party settings, we can use a longer format to entertain and for exciting competition or team-building. 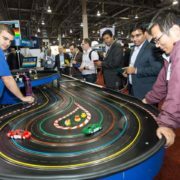 A Nomad Raceways slot car track can be the centerpiece of your event, or an exciting addition. 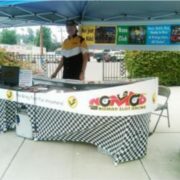 For more than 15 years we have been the hit of every event we attend. 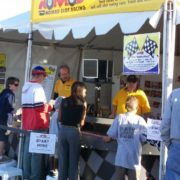 Our friendly, experienced, race directors know how to entertain children, customers, coworkers or CEO’s. This is a rare game that not only appeals to all ages but can even be played by mixed age groups. 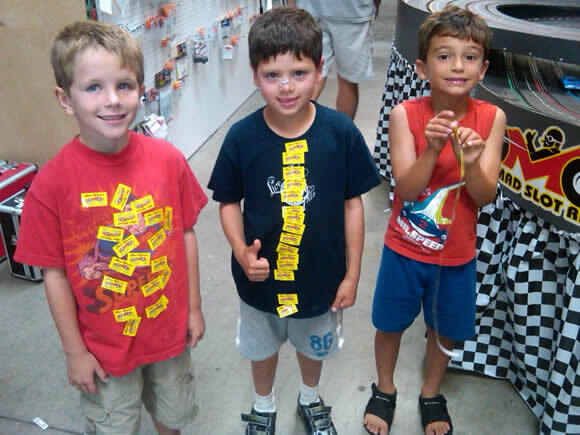 Both skill and luck are rewarded with exciting finishes and win stickers. 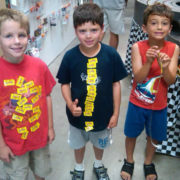 Kids and CEO’s love win stickers. 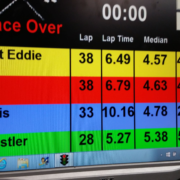 If desired, an overall champion can be awarded based on a fair competition. We usually have a special award for the Guest of Honor. More often than not, the Guest of Honor wins the Championship! Branded cars, branded tracks, and most importantly, a solid ROI. 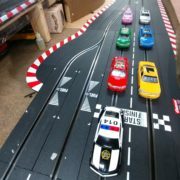 Our racetracks come in a variety of sizes and can be located indoors or out. We can provide canopies and can run on silent battery power if needed. Our wireless microphone and video displays provide adequate coverage in most cases but can be linked to multiple displays or larger sound systems on request. We can provide specific types and brands of cars on request. 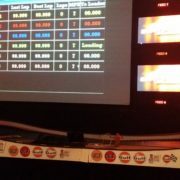 Our track walls, cars and canopies and even scoring monitors can be branded. We call that action using your brands and catchphrases. We put your brand where the action is! 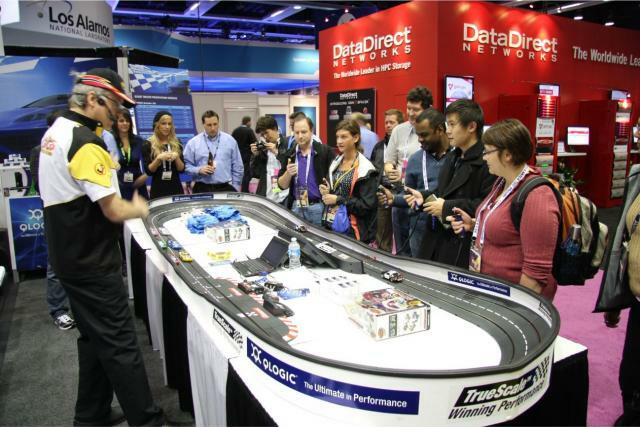 Nomad makes your booth an attraction, drives traffic and engages clients in a brief, fun activity. 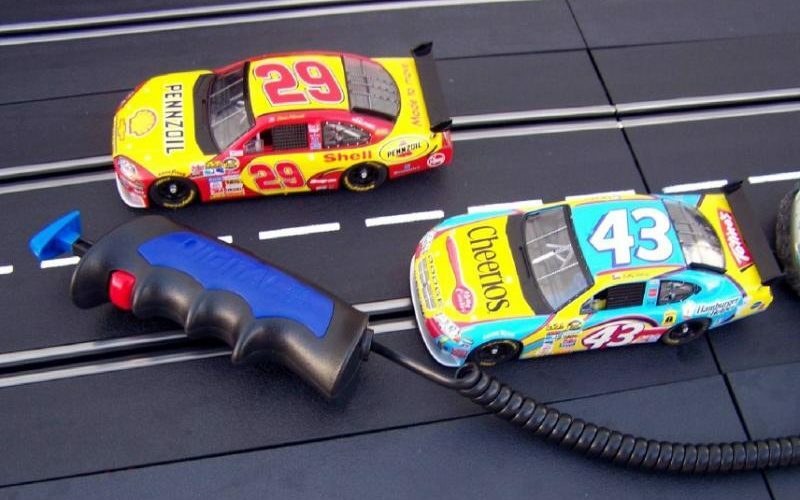 Branding on the cars and track and exciting play calling with your catchphrases make racing relevant. From branding to shipping, set-up, and presentation, we handle it all! All our tracks and cars are optimized for professional commercial use. They are easy for first-time racers while providing challenges as skills increase. The drivers control speed and lane changing with two simple buttons. Our format is adaptable to brief attract and engage events or extended entertainment/hospitailty situations. 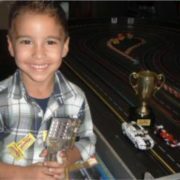 Our race format maximizes speed, action, and fun for all ages. Most of our tracks are for 6 drivers at once. 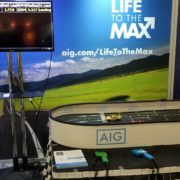 Three autopilot cars also add the challenge and excitement. We run a new race every 2 minutes, so we can serve up to 180 people per hour. Of course, more will be involved in watching the races. At promotional events focus on sustained excitement and maximizing the number of contacts, we can even scan prospect badges for you. Our repeated clients have proven that we increase their lead generation. 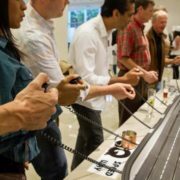 At private events, like parties, receptions or conferences, we encourage repeat participation in progressively more exciting competitions. Either way, every winner gets a “Race Winner” sticker. 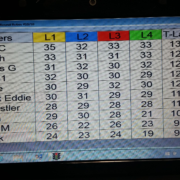 We can do a “championship race” for the returning winners to bring each day to a great finale. 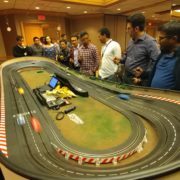 Nomad Slot Racing has thrilled innumerable corporate, club and private party events. Check our testimonials page to hear what our customers are saying. We bring the fun anywhere, worldwide, and we handle all the details. For more info, call us at 760-492-4619 to discuss.